The long flight from Shanghai to Milano falling in and out of sleep, in and out of time zones, becomes short moments of collecting, assembling and trying to recall whatever thoughts come my way. Memories, fantasies, confusions and obsessions journey through the eye and brain trying to organize themselves as we finally land. 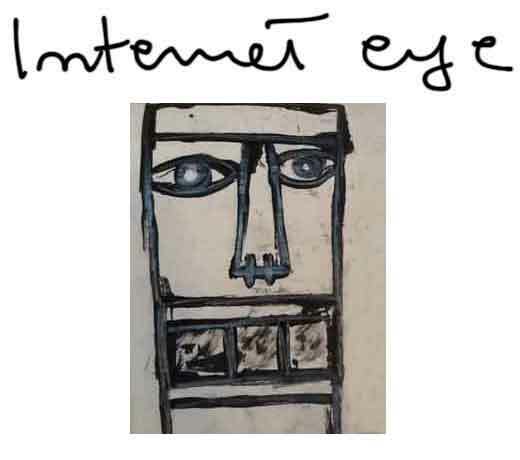 Placed now here staring at me as a surrealist eye that really should be closed on my Sunday desk. Here on the floor in my office is Kris Ruhs eye light. Made in 1991 as the prototype for an expanded line of eye lights, it is made of yellow glass and steel, the drawings still sit here on my desk. The shape of the eye, the mystery of what we see and what it shows of us is always a subject of design. Here “The False Mirror” by Magritte painted in 1928 and The Witness, a seat created by Man Ray and edited by Gavina in 1971. The names alone revealing our fascination with what the eye is for us. 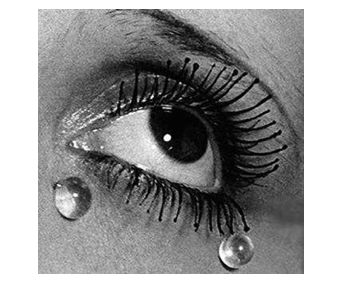 The glass tears of Man Ray were created in 1930. The photo image has a strong emotive expression. It is said that he took the picture after he broke up with Lee Miller an American photographer and expatriate during the war who Man Ray observes here, cried tears as hard as glass. 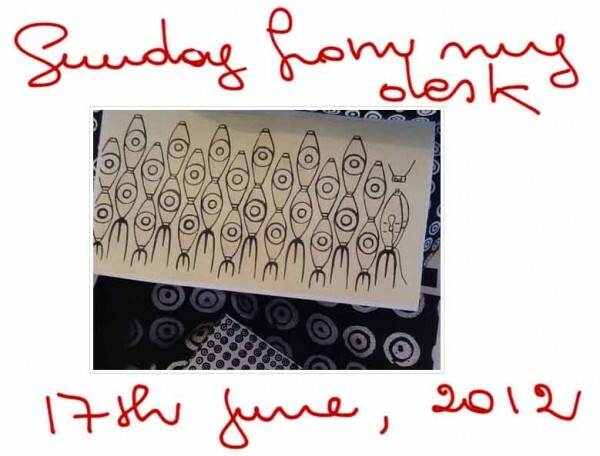 A strong independent woman, Miller is now having a retrospective of her work in Denmark, The Surrealist Eye this month. 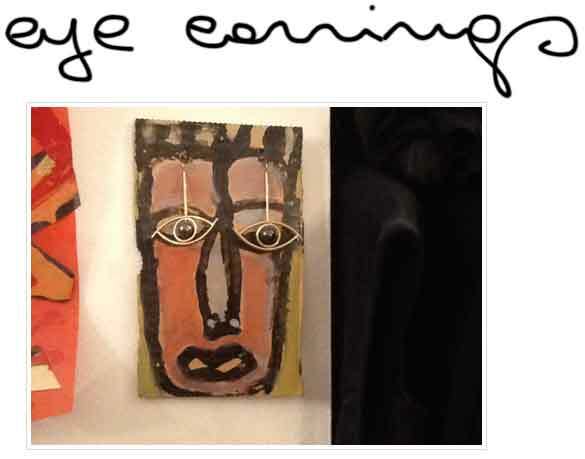 Here Kris Ruhs’ “golden eyes” earrings hanging on one of his paintings. Many artists enjoy designing jewelry but few actually execute their own pieces. 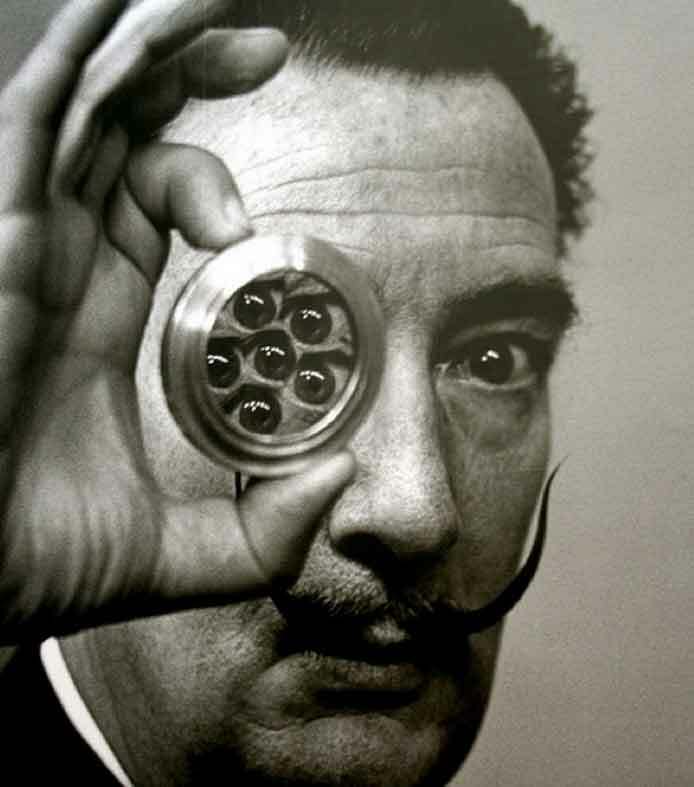 Philip Halsman took this photo of Dali with an Eye Prism. Friends since 1940, this was another collaboration between two good friends. Halsman took many pictures of Dali based on Dali’s own layouts. In 1961, Halsman published a very interesting book explaining his work and the “rules” for creating unusual works. His six rules included the idea to add an unusual feature to capture the attention, draw the eye to something unexpected. A real school of thought for future photographers. 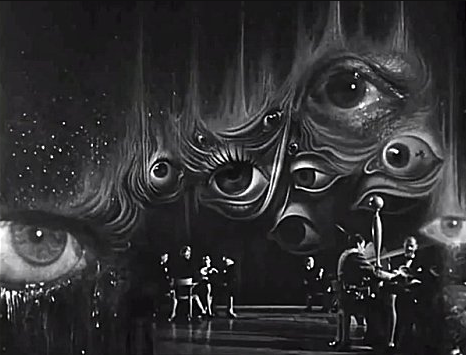 Here from Alfred Hitchcock¹s movie, the eyes of the dream sequence in Spellbound, after a Dali project. Made in 1945, this film impacted art and fashion going forward. A whole new way to see beauty, it created another fashion vocabulary. At a time when psychology and the unconscious were new medical territories, seeing into the soul was not such a safe place to go to a cocktail party like this without Jung and Freud along. Many artists have used the motif of the eye to express a mood in their work. 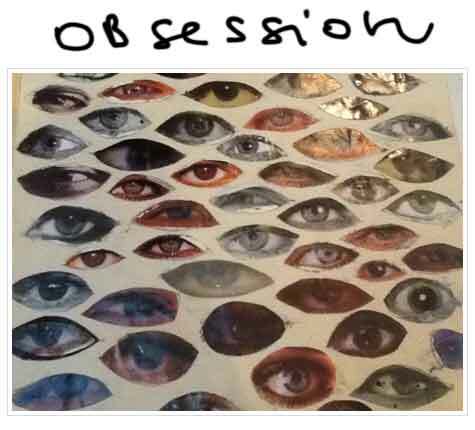 Here those eyes are recontextualized into another piece of art altogether that speaks to our obsession. The single eye of Odin in Norse legend was the sign of wisdom but the eye of the internet does not share his understanding. Only by sharing our ideas with others, being with them and talking of the things we care about can we have a true life. That is why it is still so important to turn off the internet eye and go see what is really out in the world. The single eye – a tv eye – also Odin the Norse God has only one eye – the other he had to give up to obtain knowledge of everything past and future to become all powerful. The twilight came for him and the other gods when he became greedy for the gold ring and the gods gave way to man, with two eyes. 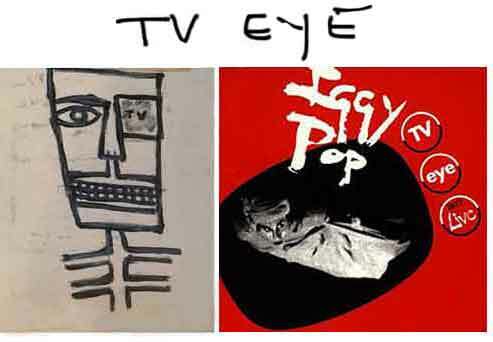 Iggy Pop recorded TV EYE in 1977 from a live concert. It is still big on You Tube. 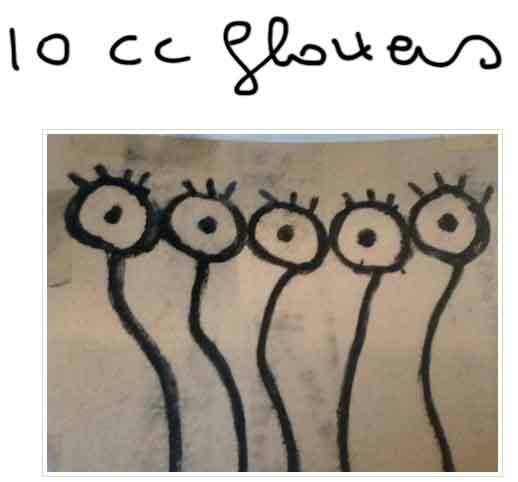 These happy bouquets of 10 Corso Como look like the bright round eyes of flowers open and smiling,to the world.